The bedroom tax is creating a backlog of families on the emergency housing waiting list, Northampton Borough Council’s housing chief said, after figures revealed an average wait of 21 weeks. A Freedom of Information request by the Chronicle & Echo shows there are currently 3,065 people waiting for a council house in Northampton. Those with the most immediate need, such as families on the brink of homelessness and people who need to move on severe medical grounds, face an average wait of almost six months for a property. Those with lesser need are waiting an average of 91 weeks, though one man, it has been revealed, has remained on the list since 1988. 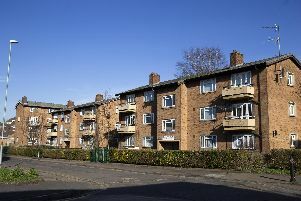 Borough council cabinet member for housing, Mary Markham, said the Government-introduced under-occupancy charge, in which families pay extra to live in social housing with unused bedrooms, had caused an influx of families having to go back on the emergency waiting list to find smaller homes. She said: “We are working hard to improve this and as you know we have secured funding from the government to build 100 new homes at Dallington Grange, that’s one of the biggest social housing developments in the country. “Inevitably though we are going to have a lot of people waiting for emergency housing because we have had the welfare reforms to deal with. Councillor Markham said the council was facing the biggest demand for one- and two- bedroom homes as people seek to downsize from larger properties, which was leaving larger homes standing empty. The borough council advertises a list of available council homes fortnightly and all those registered can bid for the available properties, with the homes going to those with ‘the most need’. Councillor Markham added that band B waiting times were so long because several people on the list did not want to bid for ‘low demand’, less desirable properties, while others simply wanted to wait for a home in a particular area. In the case of the man that has been on the list since 1988, a council spokesperson said the man had no wish to move. Councils across the UK have seen their social housing stock decline since the introduction of the Right to Buy scheme, which entitles most council tenants to buy their home at a discount. Councillor Markham said the borough council is having to find new ways of increasing the available homes to bring the waiting list down as a result, including using monies from the government’s Empty Homes Scheme to convert unused property into social housing stock. Units above the Blue Arrow recruitment outlet in Abington Street and another property in St Giles Street are in the process of being converted. The council has also appointed two officers to run a ‘mutual exchanges’ scheme.